How do you host a party for your little girl (or boy) on a frugal budget? Well, for one thing, you do everything yourself instead of paying out of pocket for it. 1. 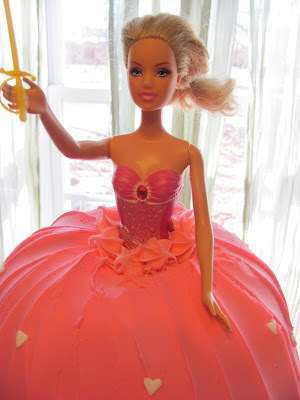 Watch videos on how to make a barbie doll cake. Listen carefully to the instructors so you get the cake just right. Baking the cake and freezing it ahead of time can save you some time and money later on. This way the cake is waiting for you. If it doesn't turn out, you'll have plenty of time to rebake and start over. 2. Make appetizers from your stockpiled pantry and freezer. Frozen spinach boxes I snagged for $.60 and sour cream for $.59 turned into a great Spinach Dip. If you're not sure what you can make with something in your stockpile, visit the brand's website to see if they have any recipe links. It's a great way to try new recipes. Also, keep an eye out for sales and buy when things are cheap. Plastic forks for $.39 and straws for $.39. Yep, that's a Walgreens deal from November. 3. Make your own invitations. I found some clip-art and printed out invites. 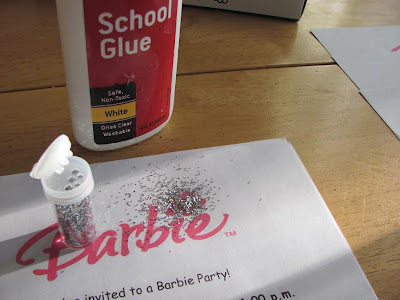 Then glued on some glitter to make them sparkly. 5. Keep decorations to a minimum. 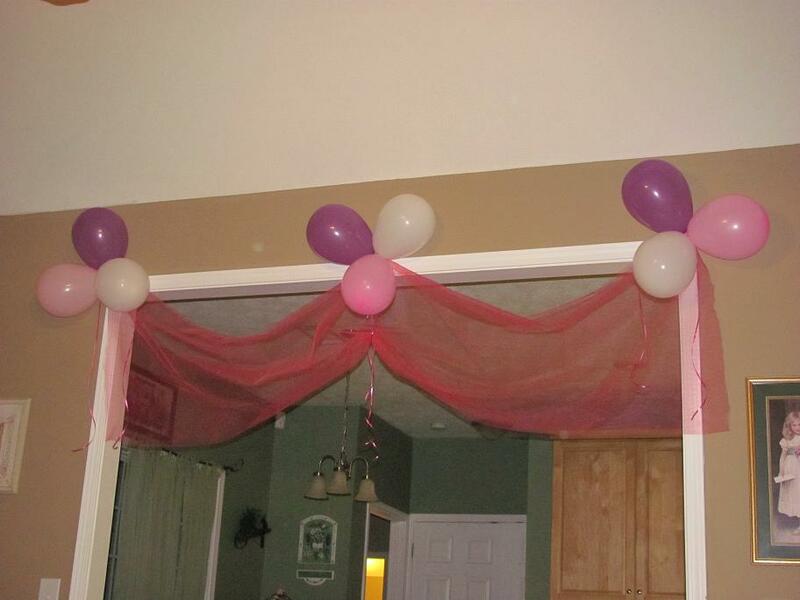 I bought some cheap balloons at Walmart and bought some hot pink tulle from Hobby Lobby using a 40% off coupon. Tying the balloons in the corners of the walkways with the tulle draped across, makes for inexpensive, yet festive decorations. 6. Make punch from kool-aid. We decided to stick with the pink theme and used pink lemonade. Freeze some kool-aid in a Tupperware ring (or Bundt pan) and store in the freezer for the party. Think ahead because if you're like me, I only have one ring so I started about a week before the party to get a couple of these frozen. Buy kool-aid packets when they are on sale $.20 a packet. Have sugar, kool-aid packets and pitcher on hand to mix up as needed. It's cheaper than soda and no caffeine to make the kids nuts. 7. Visit the Dollar Tree for some great "thank-you-for-coming" grab bags. I snagged a couple of bags of candy along with these cute puzzle necklaces, all for less than $10. I divided everything among some "princess" lunch baggies for all the girls to take home. 8. Print coloring pages off the internet. I chose some Barbie and the Three Musketeers coloring pages, since that's the movie we planned to watch. I also grabbed two boxes of 64-count crayons from the Dollar Tree and dumped them into a box for the girls to color at the table. 9. 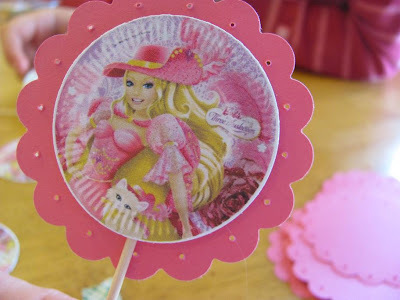 Barbie Makeover Table. This could have been expensive, but I picked up on some clearanced hair glitter after Halloween. So that was a huge savings. We also used some store rewards to pick up some pretty sparkly fingernail polish at Walgreens. My biggest surprise find was at Goodwill. They had received boxes of eyeshadow and lip gloss from a drugstore and marked it 4 for $1. So I got a couple of shades of each. This was a HUGE hit! The girls had more fun applying make-up to each other than anything else! So cute! 10. Keep it simple. I got this idea from my cousin. She said let the girls decide what they wanted to do. So from the beginning I let Sissy decide what we were going to do for the afternoon of the party. She said she wanted to watch a movie and play Barbies. She also wanted a Barbie cake. 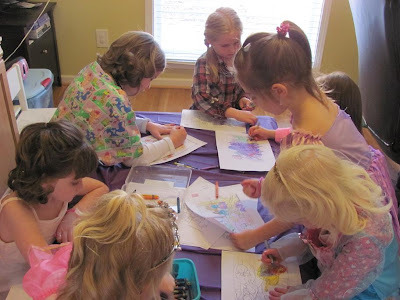 We talked about the other fun things we could do and she decided on coloring and sparkles in her hair. All in all, I think she did a great job for a 4-year-old. Everyone had a great time. Can't wait until next time! How do you party on a budget? Top Ten Tuesday at Oh Amanda! We had such a wonderful time at the Barbie party. The girls are still talking about all the fun. Nothing better than seeing children play so sweetly. Thanks so much for your hard work and weeks of preparation! Looks like a blast, and great tips. Great job on the cake, I am really impressed. I really need to get my cake decorating skill in par. Ways I save, is to always cook the food myself, dollar stores make wonderful goody bags, and fun party ideas, and I always make my invites and all. This. is. amazing. Wow! 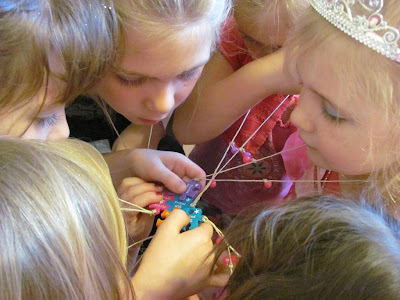 Great ideas, all so clever, put together so nicely in a blog post. My middle son has a birthday coming up--but I think I can tweak some of these ideas and make it a blue and bob the builder type theme. :) Thanks! 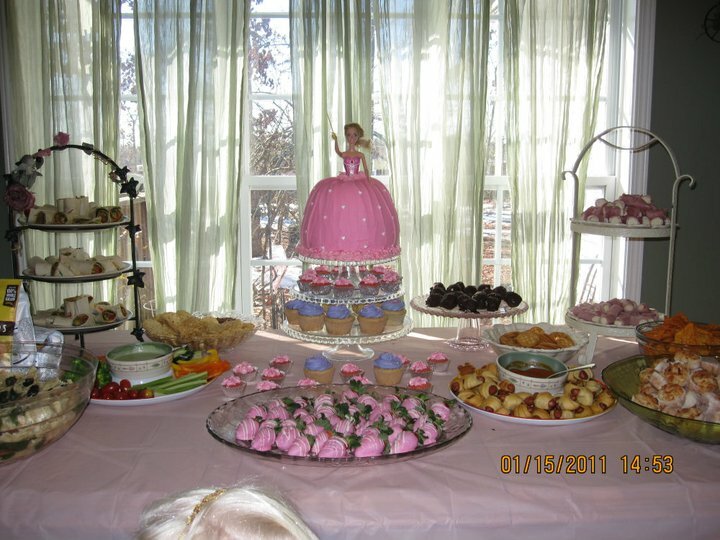 I so badly wanted a Barbie party growing up! Can you be my mom? !